Magentc trays are perfect for catching small objects at a construction site, manufacturing/production plant, utility sites, etc. These trays can securely attach to tool boxes, towers, or metal structures. They are constructed with durable corrosion resistant stainless steel and can withstand the harshest of conditions. Having magnetic trays at the jobsite ensures the reduced risk of FME and FOD hazards. Encourage a drop free zone jobsite with the addition of the magentic trays. Keep loose nuts, screws and other small metal items in reach. 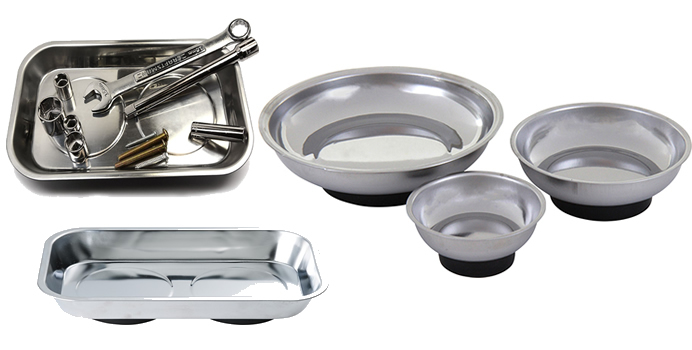 Smooth stainless steel trays have powerful ceramic magnets with rubber covers in the base to secure the tray to a metal toolbox or table while keeping important metal pieces at hand. Store metal parts and tools during assembly and disassembly. Ideal for mechanics, craftsmen and hobbyists. Keep small parts and tools from disappearing when you’re working on your car with one of these ROUND Oval-shaped magnetic tool trays, decorated with the logo for your favorite brand of car. Great for jobsite, garage, office and home.